You’re happy, right? Your life is pretty great, isn’t it? You’ve got friends, a pleasant job, possibly a love interest; what more could you want? A giant robot. That’s what you could want. A giant robot you can ride inside of while it rolls down the street smashing cars and firing missile storms at low-flying crows. Thanks to a Japanese artist and his roboticist partner this beautiful dream could be yours, assuming you have at least $1.35 million to spare. Created by artist Kogoro Kurata and roboticist Wataru Yoshizaki, the “Kuratas” is a 13-foot-tall, 4.4 ton behemoth with a centrally located cockpit, a user interface that includes touchscreen control as well as Kinect-based motion control, a diesel engine and the ability to make phone calls directly through the machine’s main console. Most impressively however, the Kuratas is fully customizable. By visiting the Suidobashi Heavy Industry website you can select (presumably non-lethal — though we aren’t entirely positive on that) weaponry, paint schemes and surprisingly esoteric extras like giant shields and leather seats. It all feels a bit like something out of an Armored Core sequel, and we’d be lying if we said that wasn’t really, really cool. As you’d imagine, some of these extras will increase the cost of your mecha. 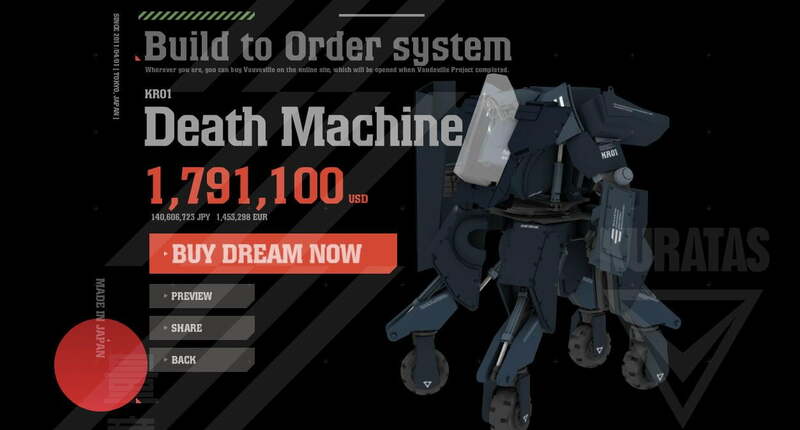 You can see my ideal ‘bot in the image above, and while it is utterly rad, the final cost to kit the thing out fully came to $1.79 million. We’d also assume that since these things are being built in Japan that we’d be levied a pretty sizable shipping fee if we were to purchase one. Additionally, there doesn’t seem to be any estimated time of release for the Kuratas, so for all we know the company might fold before it gets around to putting your mecha together. Taken together that’s just too many question marks for us to drop nearly $2 million on. Still, we wouldn’t want to dissuade any of our eccentric billionaire readers from buying an army of these and going mad with power. Sure, it would have looked cooler had the design been bipedal (rather than a quadrupedal wheel configuration) but trust us when we say that nobody will make fun of a giant robot while it’s crashing through the wall of their house. Oh, and we would also like to offer immense praise to Kurata and Yoshizaki. The Japanese have collectively been dreaming about this day since the ’70s, and it’s nice to see all that anticipation finally pay off. We only hope this spawns a cottage industry of custom robot builders, each forcing the others to continually improve, until we finally get squadrons of color-coded lions that can join forces to create a huge, sword-wielding defender of the universe.